Warm weather brought some more good lap times this week, with drivers in Peterborough having the track to themselves all night for unlimited racing! 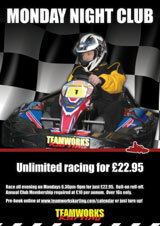 Monday Night Club gives you unlimited racing from 6.30pm-9pm for just £21.95. Unbeatable racing at unbeatable prices!